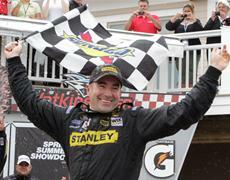 The happy smile of Marcos Ambrose should sum up the Monday NASCAR Race at Watkins Glen; but unfortunately that’s not true. The madness over took the thrills of another first time winner. I am not entirely sure if all the rain or the fact of racing on a Monday but the drivers and the racing on the track got crazy late! Surprise Brickyard 400 winner Paul Menard was running in the 14th position with 4 to go when a cut tire sent him directly into the outside barrier, sparking a fire underneath his No. 27 Chevrolet and relegating him to a 32nd place finish. The extended cleanup caution pushed the race into overtime, forcing the one and only attempt at a green-white-checkered finish. Busch had the lead on the restart with Ambrose starting second and Keselowski in third. Ambrose spun the tires on the restarting, allowing Busch and Keselowski to battle for first in turn one. Busch slid outside in turn one, pushing him back to third behind Keselowski and Ambrose. Despite Ambrose’s bad restart, he was able to glue himself to Keselowski’s rear bumper and slightly nudge him out of the way for the race lead. As Ambrose stretched his lead and took the white flag, chaos unraveled behind him as drivers raced desperately to improve their positions. 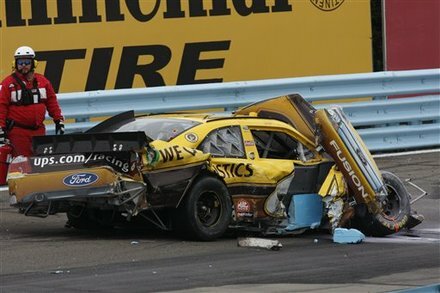 Contact between Boris Said and David Ragan ended in a terrifying wreck which also collected David Reutimann and Mark Martin. Ragan was hooked and sent directly into an angled wall, demolishing his car and sending it back onto the track where he collided with Reutimann. The collision sent Reutimann’s car airborne and upside down, obliterating his Toyota Camry. These pictures can tell 1,000 words; but Greg Biffle and Boris Said have shed more words than that and a few silly swipes and threats. Biffle and Said clearly have a problem with one another but today that went a little deeper. Some say Biffle was sticking up for his teammate and Reutimann and others say he was acting cowardly. Well, honestly I think that this feud is no where near over especially when Said claimed that he was going to hunt Biffle down and basically give him a “whoopin” .